Guido has taken over the cat carrier that stands on the garden bench. He's in there for his morning nap, but when you walk past, he says, "Squeak!" and asks us to pet him. We have a fan page on Facebook! 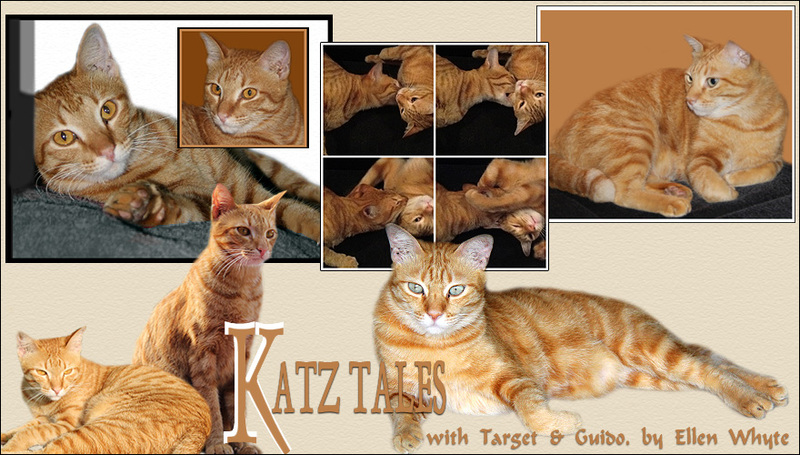 http://www.facebook.com/KatzTales A one stop centre for Au's tweets, quick updates and photos. Come like us? So I'm in our local petrol station, saying hello to the lady who's been working there forever. Whenever I say, "Good morning!" she says, "Selamat pagi!" and when I say, "Selamat pagi!" she says, "Good morning!" I then continue in English, mainly because when I speak Malay people don't listen because they KNOW white people don't speak it. Also, I have a strong Indonesian accent which further confuses people. Anyway, the focus on English must have annoyed her because one day this lady says to me, "We always speak English. You have been here a long time. Why don't we speak your mother tongue one day, and mine the next?" "Cool," says me. "Shall we start in yours?" "No, let's do yours first," she says. "Goede morgen," I say. "Hoeveel is het vandaag?" There's a long silence, and my friend says, "So English isn't your first language?" Funnily enough she's not up for learning Dutch, but the English focus doesn't upset her anymore, so we're continuing our half-Malay-and-half-English chit-chat. And she has a lot of fun telling other people that my mother tongue sounds like gargling. Guido has a new book. He's reading Fan Goes To Sea by Dawn Farnham. The story follows the adventures of Fan, a little Chinese boat. It's available in Malaysia and Singapore. Selling price RM24.50. A great Christmas present for kids! And Guido knows that when you're a kitten, having fun is the most important thing in life! I put our clean bed sheets on the table, turned my back for a second, and found Au ensconced in the clean cotton. He was grinning and shedding white fur evenly all over the dark blue material. Note the claw sticking out that says, "Dis is my place and I'm staying!" We have regular floods in our neighbourhood: a result of construction chucking rubbish in storm drains and bad home design. When the water started rising, Target became nervous. Target went upstairs where it's safe but Au decided to check how bad the flood was. The senior cat decided an inch of water was Too Much, and went upstairs too. Guido on the other hand decided it was time to paddle. But when wet paws proved too much, he asked to be lifted onto the sofa so he could dry his feet. Now we are dry again. Until the next time. Which, considering it's monsoon season, is probably at 4PM. Guido "killing" the living room rug. I'd like to say I was surprised when Annabelle and Olivia (friend and sister) called to ask if we could take in a solitary emaciated kitten they had found outside the shop, but I wasn't. Whether he was dumped or had crawled over led by inner intuition that help was near, we will never know. Over the years we have rehomed over 180 cats and kittens and TNRed almost 3 dozen. Keeping our numbers realistic has always been a challenge. Aside from financial constraints, we are constantly walking the fine line between overcrowding and quality care. Feeling optimistic that day, I said yes, but he would be the last until we rehomed or released some. Jake was discovered during one of our busiest times; we had too many adults that had spent almost a year with us without finding a family and a bunch of other abandoned kittens. However, the little man seemed to understand our stretched finances and over taxed schedules; he accepted his Accurate calmly and struggled just enough during his bath to hint at his indignation and eventual vigour. He promptly began eating and quickly gained weight, growing a handsome glossy coat and charming the socks off man and beast. And the rest as they say is history. Sailing under a lucky star, he came to be adopted by a lovely couple who offer him a forever home, love and a fair amount of roast chicken. What else can a cat ask for? If you want to adopt a pet, or happen to have tonnes of spare cash to give away, do consider calling Pet Epicure or check their Facebook page. It's our 789th post and we're celebrating! Au is tearing up newspapers and making his own cat confetti. It's his favourite game and requires T-man to touch his tail so that Au can rev up the meows. Guido is lying about looking furry cute. He's a talkative kitty, and the first person we've known in ages to say, "Meow" like a cartoon cat. Target still says meep and Au has a foghorn MAUUUUUUUU! Target is totally flumped. He was up all night cleaning his face, rubbing his whiskers and sliding down the pillow and giving me furry purry headbutts to tell me how much he loves me. It's sweet but I would like a bit more sleep tonight. Anyway, we had a look at our stats and we're proud to say that we get over 7800 hits per month, with about half of our visitors from Malaysia, and the others divided between North America and Western Europe. Thanks for all of your visits and comments; we love being part of the cat blogosphere! Target: Why Am I Yawning? Last night T-man was roaring like a tiger. Guido and I were sleepy but mummy-cat was muttering some furry bad words, and then upsetting me by trying to hide under my pillows. At about midnight she got up and went to the other bedroom. This meant I had to check on her at 1AM, and again at 4AM. Guido was furry nice and he helped by checking up on her at 3AM and Au checked her at 5AM. Checking isn't easy because it means rubbing noses, giving her furry purry headbutts, and stepping over every inch of her to check the blanket is wrapped round nice and tight. So I'm furry tired today. I think Mummy cat has noticed because she says she'll keep the door shut next time. I think it's a good idea. If the door is shut, she can't go to the other room and then we cats won't have to keep checking on her. We cats need our sleep you know. 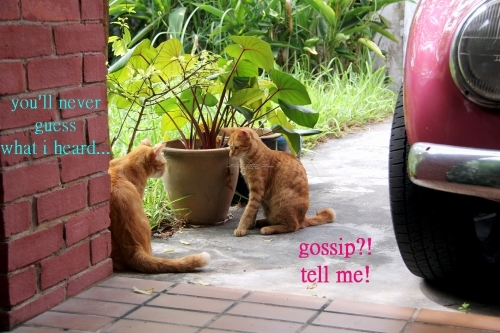 ... so if they have a secret to tell, they put the cat outside!